Christie announces 2016 bid in characteristic form. New Jersey Gov. Chris Christie formally jumped into the crowded Republican presidential field here on Tuesday, stressing his leadership of a blue state and blaming both parties for the gridlock in Washington. 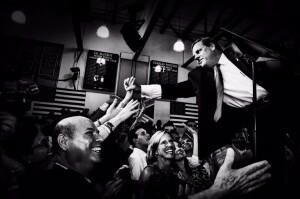 “We need a government … that remembers you went there to work for us, not the other way around,” Christie told a crowd of about 700 people at a packed gymnasium at Livingston High School, his alma mater where he served as class president and catcher on the baseball team. Christie’s message was aimed at a general election audience, not the highly partisan Republicans who populate early state contests. He focused on his stewardship of New Jersey, noting its density, ethnically diverse population, and Democrat-controlled state legislature. “This country needs to work together again, not against each other,” said Christie, who walked on a stage as Bon Jovi’s “We Weren’t Born to Follow” blared on the loudspeaker. The governor added that he would welcome good ideas from Democrats and Republicans alike. The 52-year-old governor hammered home his slogan “telling it like it is” during his 20-minute speech, declaring to supporters, “I mean what I say, and I say what I mean.” He also took a hit at Democratic front-runner Hillary Clinton. “President Obama lives in his own world, not in our world … better not turn it over to his second mate, Hillary Clinton,” said Christie. Christie faces a steep climb from his current underdog status in the sprawling GOP field. Still, several people involved in the campaign believe a path to victory still exists. Ray Washburne, Christie’s finance chief, told msnbc it largely rests on three main tenets — holding town hall meetings (a format he does quite well in), eventually showing off his debate chops on the national stage, and putting forth concrete policy proposals. “He’s laid pretty low in the last few months to get through the budget season. Now that he’s finished with that, he can really get out on the road and really let people hear him and see him,” said Washburne.